When it comes to recovering from substance abuse and dependence, community can be key to achieving and sustaining sobriety. High levels of social support are a powerful factor in recovery, associated with less time spent in rehabilitation centers and an easier reintegration into society1. 47 percent of substance abuse treatment facilities in the United States host self-help groups, and nearly 54 percent offer peer support programs; these services can help recovering substance users share their experiences and find strength in one another2. In the age of social media, recovery support communities have also begun to flourish online. With the help of hashtags such as #sober, #soberlife, and #12steps, those coping with substance use have taken to social networks, broadcasting their stories and daily experiences of recovery. So what are they posting the most – and where are they posting it? We examined over 79,000 Instagram posts in the U.S. containing tags related to recovery and staying sober and mapped their locations to see which states and cities are discussing sobriety the most. Keep reading to find out which places are staying socially sober. The substance abuse recovery community makes use of a variety of hashtags related to conquering addiction and getting and staying sober. We took a look at nine of the most popular sobriety-related tags to see which are used the most often. By far the most widely used recovery-related tag is #soberlife, mentioned 32,707 times, while the runner-up, #sobriety, was used 19,033 times! Specific programs, such as #narcoticsanonymous with 1,638 mentions and #alcoholicsanonymous with 1,272, are less commonly used. 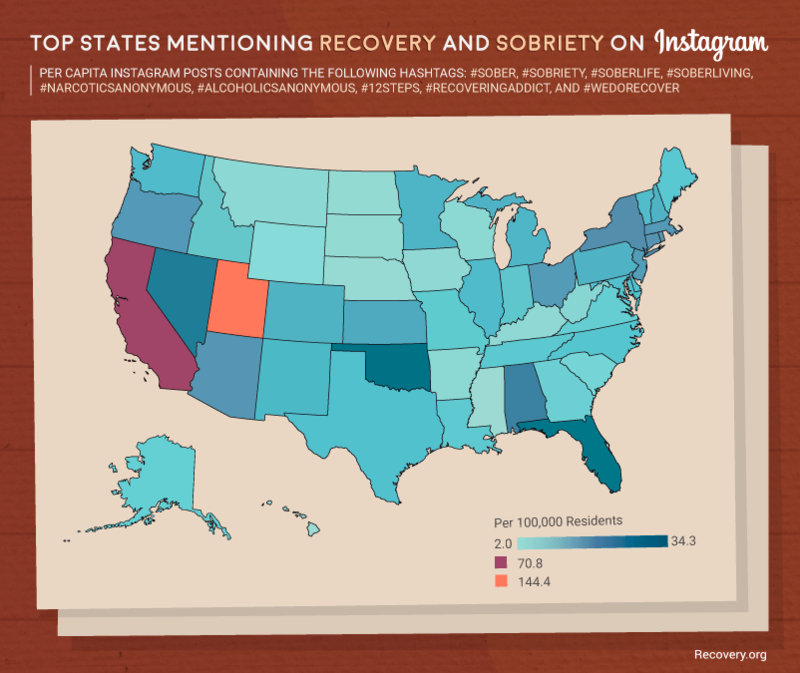 We also mapped each Instagram post to the state it originated from and calculated which states have the most and least posts per capita related to sobriety and recovery. Two states stood out so much they required a special legend: Utah, with 144.4 posts per capita, and California, with 70.8. 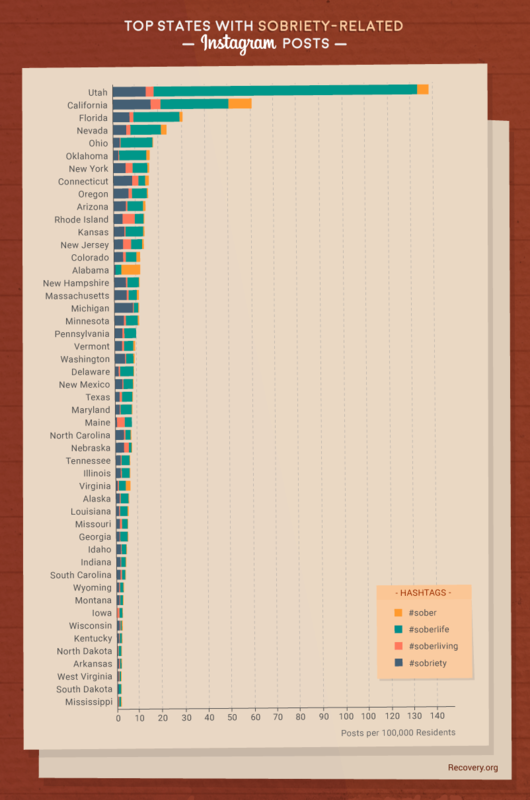 The remaining states, ranging from 2.0 to 34.4 per capita, don’t even come close. Meanwhile, some of the least active states for sobriety-related Instagram posts are Kentucky, North Dakota, South Dakota, and Mississippi. 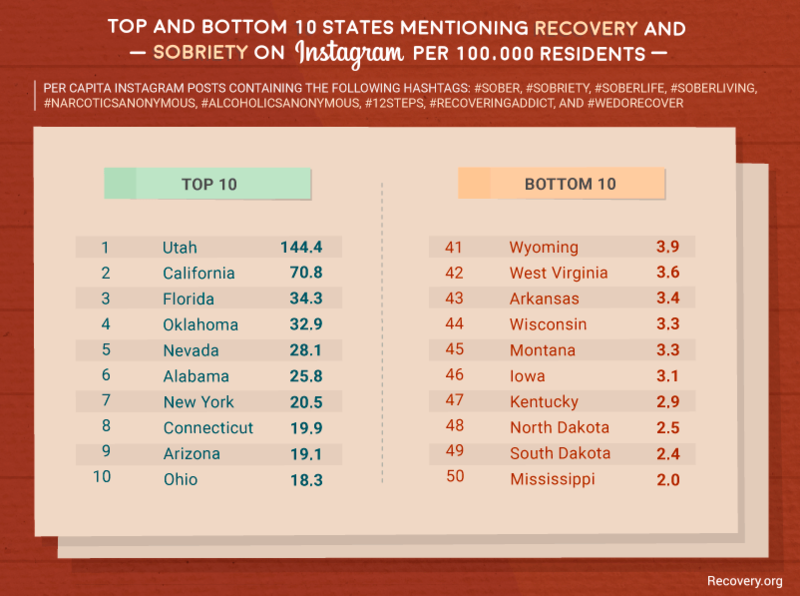 Surprisingly, the national pattern of Instagram sobriety posts differs substantially from actual levels of substance use in these states. Utah, No. 1 in posts per capita, shows some of the lowest levels of reported past-month illicit drug use by those aged 12 and up – yet so do North Dakota and South Dakota3. California, No. 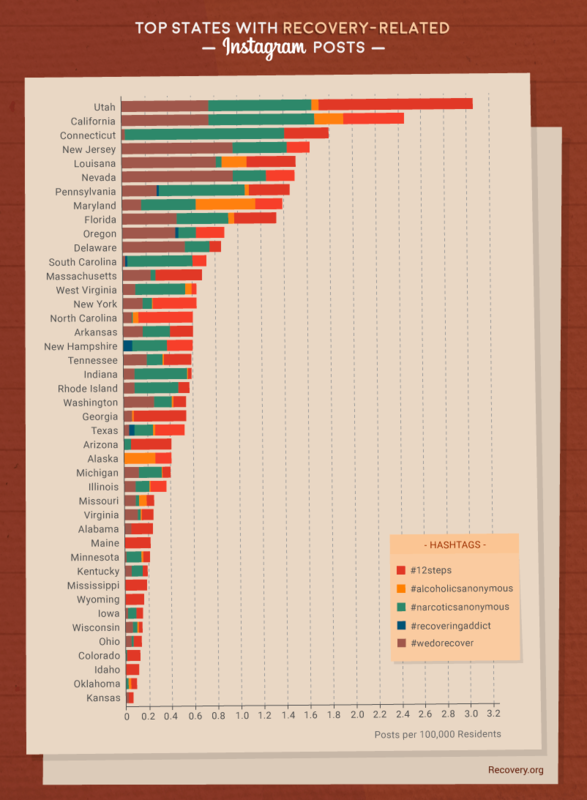 2 for Instagram posts, shows moderately high levels of past-month illicit drug use, but so does Montana in 45th place. Many people across the nation are using illicit substances, but not all of them are Instagramming their recovery. Seeking treatment is brave. Instagram and other social media forums provide terrific public platforms for people to celebrate their hard work, demonstrate pride in their recovery and, hopefully, encourage others to do the same. There should be no shame felt in finding oneself in a situation where help is needed. If you’re uncertain about your treatment options, call 1-888-319-2606 Who Answers? . Compassionate treatment support specialists are available 24 hours a day to provide the information that you need to locate and select a recovery program right for your situation. We looked at several hashtags specific to recovery and recovery programs, such as #12steps, #alcoholicsanonymous, #narcoticsanonymous, #recoveringaddict, and #wedorecover and charted how prevalent these were in each state. While Utah and California once again place first and second, the gap is much narrower: Utah has only about 22 percent more recovery-related Instagram posts per capita than California. #12steps is the most commonly used recovery-related hashtag in Utah, with #narcoticsanonymous and #wedorecover being roughly the same. Surprisingly, even though the organization is one of the oldest sobriety-oriented support groups, #alcoholicsanonymous sees very little use across the country. Only in Alaska, where heavy drinking is markedly more frequent than the national average, is #alcoholicsanonymous the most used recovery-related tag4. When it comes to staying sober, the national landscape looks a bit different. 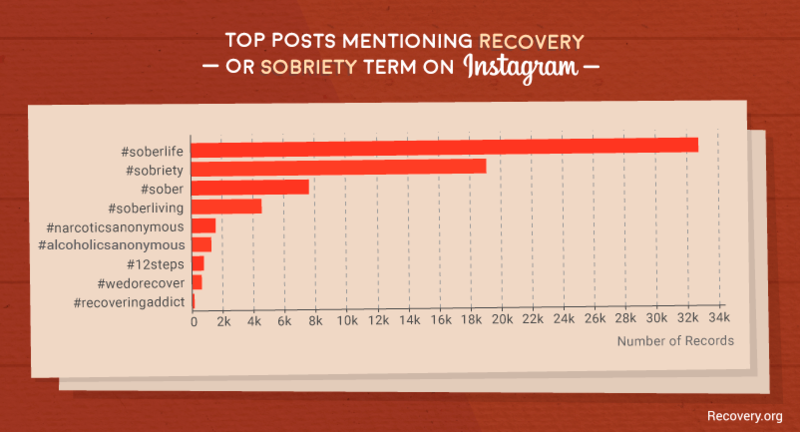 We specifically looked at hashtags such as #sober, #soberlife, #soberliving, and #sobriety to see how different states are talking about sobriety on Instagram. Utah and California take first and second place yet again – this time with Utah having more than twice as many sobriety-related posts as California. This may be due to many residents of Utah choosing to abstain from any consumption of alcohol5. Which Cities Are Instagramming Sobriety? 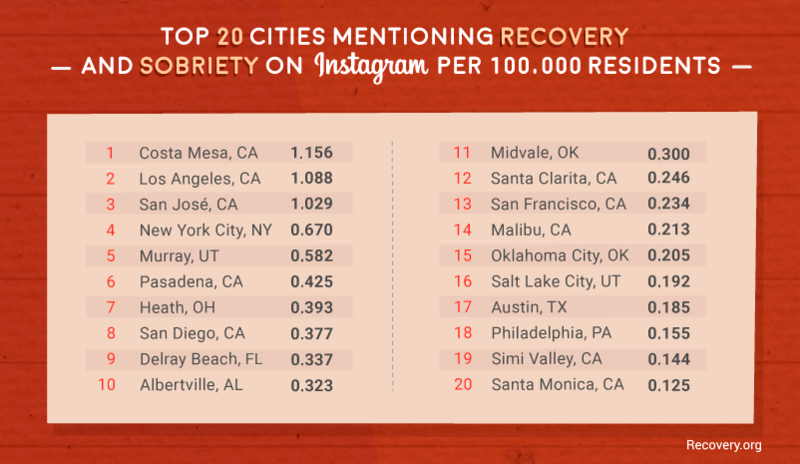 Finally, we located the cities from which each sobriety- and recovery-related Instagram post originated and tallied up which have the most per capita posts. While California only came in second for posts on sobriety and recovery, the top three spots are occupied by the Californian cities of Costa Mesa, Los Angeles, and San Jose. Pasadena and San Diego likewise appear in the top 10. Yet Salt Lake City, capital of first place state Utah, only comes in at No. 16. When you’ve made the decision to seek help for addiction to drugs or alcohol, there are many places to turn. From online community support to professional treatment programs, those struggling with substance use have a variety of options for working toward sobriety. If you’re ready for recovery, contact Recovery.org today to find a rehabilitation program that works for you. With expert help, you can reclaim your life from substance addiction. We scraped 79,768 Instagram posts from the first week of May 2015 containing the hashtags #sober, #sobriety, #soberlife, #soberliving, #12steps, #alcoholicsanonymous, #narcoticsanonymous, #recoveringaddict, and #wedorecover. Data on the latitude and longitude of each post’s origin were converted into “city, state” codes in order to quantify U.S. location totals. Per capita figures were determined using U.S. Census Bureau data on state and city populations. Please feel free to share the images found on this page freely. When doing so, we ask that you please provide readers with a link back to this page so they can learn more about this project, our methodology, and any related research.